At Biowarrior, it is our purpose to show you the healing and revitalizing benefits of nutraceuticals (pharmaceutical grade natural health supplements) so that you can overcome your biggest health obstacles, and live life on your terms. Friends, I would like to make a pledge to you, and I’d also like you to know why I spent 8 months and every penny I had to create and source these amazing products. There's way too much disinformation out there. It's hard to know what’s healthy anymore, and it’s hurting us all. The overwhelming majority of our clients experienced fatigue, brain fog and inflammation. These ailments were robbing people of their happiness and ability to live vibrant, healthy lives. Today we are just to busy to shop and prepare healthy food each day. We just don’t have the time to do so. Does that sound familiar? If you feel like you never really know what’s healthy, if you feel like you don’t know who to trust, or even if you did know, that you wouldn’t have time or patience to take their advice, well, that’s why Biowarrior is here. We wholeheartedly have faith in the benefits of Biowarrior Nutraceuticals on the countless testimonials and testing. 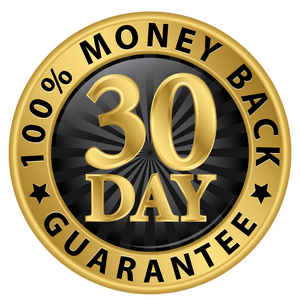 For that reason, we offer a 30-day money-back satisfaction guarantee. We strive to keep you totally satisfied, which is why we offer a 30-day, money back guarantee. If at any point you decide it’s not the best "crash free" energy supplement on the planet, Then remember you are protected by the highest standard 100% money-back guarantee. Just send us the empty bottle and we’ll refund you, no questions asked. Contact the Biowarrior team by email at: info@biowarriornutrition.com. Monday through Friday between the hours of 8:00am and 5:00pm Pacific Standard Time. We will gladly provide you with our return address, so as not to waste any materials, and a return confirmation number. This is an easy and effortless process. Return the empty bottle, the Biowarrior invoice that you received, and the confirmation number you have been assigned. It is your obligation to pay the return postage, and we do recommend you opt for tracking and confirmation numbers for verification and efficiency purposes. Note: We must receive the bottles within 30 days from the date of original purchase for the refund to be valid. We will refund your entire order, as long as all bottles purchased are returned. We can’t allow resale of Biowarrior products, so empty bottles will be refunded only after sufficient time has passed for a single customer to take supplements as directed. These guidelines were created to keep you satisfied, while at the same time ensuring we can continue to provide a quality product to other happy customers for years to come. Returning Biowarrior Nutraceuticals without complying with our policy will unfortunately deem your transaction non-refundable.